Tagged under Yuki Kure, Yumeta Company, Koei, Series, Games. Kahoko Hino was just an ordinary student at Seishou Academy. Without a glimpse of warning, a magical fairy, Lili, drops a magical violin into her lap. The very next day, her name pops up on the list of entrants for a music competition. Reluctantly, Kahoko gives way to Lili's nagging and eventually joins the concours. Progressing through the story, Kahoko must learn to deal with the prejudice of her fellow concour members, and her growing love for the violin, as well as music. Let's say I've wasted three days finishing Kiniro No Corda, which certainly dragged on like a snail. Eventually I decided to grade this a "it was fun while it lasted, but I am never going to watch this again. No, good sire. 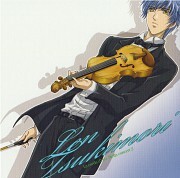 Not even to drool over Len Tsukimori and his genius skills with the violin." 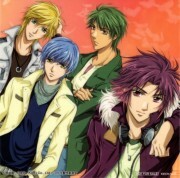 For the society members out there who enjoy harem shows, I would definitely recommend Kiniro no Corda. Ignore my blasted insults above and go ahead. You might think differently. For you guys who are values sensibility and practicality out there, hear my advice: head straight for the manga and never the anime. Even better, don't touch anything related to the series, with the OSTs as an exception. For some absurd reason, this series was extremely draining. Not out of pure suspense, see. Wonderfully portrayed music anime and also very inspiring for someone like me who doesn't play any instruments. I somehow got the feeling of wanting to play something while watching this. I really love the artwork and the character designs, though it has too many male characters and sometimes the characters do look a bit similar to each other. All of the Bishounen are good-looking. <3 This anime has great music (the OP and the ED songs are beautiful), great art. Nice plot overall. 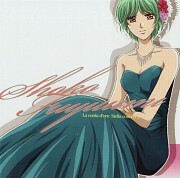 Also known as La Corda d'Oro, this anime was based on a game of the same name. 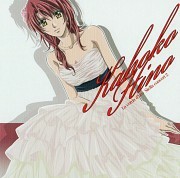 It revolves around Kahoko, a regular high school student, who gets involved in the world of Classical music. It's a reverse harem, so you can expect a lot of romance. The music is great both for those who like Classical music and for those who don't. If you're not a fan then you can learn a lot about it by watching this anime. The leading theme of this anime is music, the thread that bind together the characters with their fears, hopes, loves. I like classical music, but I didn't expect this to be so enjoyable. Usually when you have a male harem the girl is almost insignificant, but here the female character is not that bad. Nice opening and ending themes and nice art too. HINO KAHOKO: "It sure is strange. When you turn these written notes into sounds, it becomes so beautiful. How should I say it? It seems that the performer is resurrecting the notes." Oh the beautiful Ave Maria always played with heart in every performance! The deep rich tones during the Cello Concerto no.9, the liveliness of the Polonaise Brillante, the sadness in a usual piano Chopin "Tristesse" played by a violin, the madness in Fantasie Impromptu and I could list each song, but the list is too long. This is one of the reasons I love anime, the usual fusion of anime and classical music is a wonderful thing. I love listening to their pieces and while being a Vivaldi fan myself I did enjoy the many pieces played during the contest. The story introduced each character (though not entirely subtlety) their stories and lives, it was a nice change of pace during my action phase. However, while I respect Kahoko's personal conflict, it at times made it a bit difficult to relate to her. Other than her few problems the show itself was amazing. This is the first beautiful-drawing anime I've ever seen (on Animax) ,I was attracted by it so much that I wanted to find and read Manga so badly at that time=> I saw anime before manga^^,sad a bit...The story is great + happy ending (i love happy ed XD),though its only thing makes me sad is :It's ended different from manga,they ended it so fast while manga was still on going back then,only 2 eps for the whole new season T_T.This story taught me how to draw a violin and a piano,that's more good reason for me to love it.I love Len Tsukimori!!! 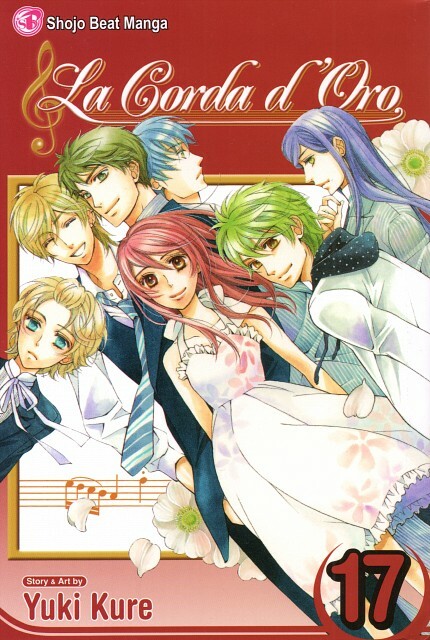 La Corda d'Oro probably has these factors as its selling points: reverse harem, cute and pretty guys, and wonderful compilation of classical music. While I think that the fact that Kahoko did not end up with any of the pretty boys in the anime series is quite a plus, the second season was pretty much a bum, in my humble opinion. The second season could have added more episodes and just partly focused on how life went for the characters after the concours. Art-wise, it's colorful, very decent, and well-drawn. One of my favorite series! :) I love La Corda D'Oro so much-- it even influenced me to play the violin! The guys are adorable (Kiriya Etou from Secondo Passo is my personal preference.) and very distinct in terms of personality. The classical pieces in the series are wonderful and some are truly heartfelt (Salut D'Amour, Ave Maria, Chaconne, La Chanson D'Adeiu and others.) The animation is superb! <3 I'm looking forward to the second season. Heck yeah!! It's fairly nice, and gives you that "tense" feeling at times. Specially at the competitions wherein there's always something bound to go wrong for someone. You feel their grief, their tension, and their want to get better. This series made me want to play the violin! And wear a dress as well! Magical anime really! And the colors of this one, just stunning. Very much a guilty pleasure. You have two reasons to be watching this show: pretty guys and pretty music. Delivers well on both. Art is fairly good, music is excellent, character guys are awesome. Story-wise, it's there, but not much. Haha. Ok. So i'm not a big Shoujo fan, this is like the most Shoujoyist thing I ever watched. I play the violin, and love it, thats what got me watching it. I was intrigued by a series so surrounded by it, and the love of music in general. But I ended up really liking the characters, and got attached to them and it kept me watching! It was fun, I watched the entire series in 3 days while I was sick. XD I also read the Manga (On-going) which is very good. I might like it better than the anime personally. Loved the manga, had high expectations for the anime... was only partially satisfied. It was pretty good until the end. HORRID ending. But, um, a nice series overall. It was nice to be able to hear the music, which you don't get from reading it. Other than that, though, the manga is superior in every way.